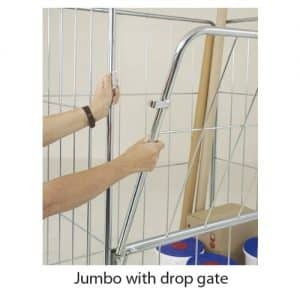 4 sided jumbo roll pallet with half drop gate option. 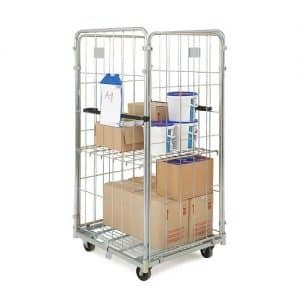 Ideal for warehouse distribution or retail. Sides detach for easy storage. Complete with rubber tie straps. 125mm diameter nylon castors with roller bearings – 2 swivel‚ 2 fixed. Hook on shelves available – see accessories. (H)1820 x (W)1200mm x (D)800mm. Complete unit can be dismantled. 2 sided strong reinforced design. Available with 2‚3 or 4 sides and optional shelves. Fitted with 2 fixed 2 swivel 100mm diameter nylon castors. 500kg max capacity 100kg max per shelf. Each unit has 2 load retaining straps. (H)1690mm x (W)715mm x (D)800.